Sam Parfitt is the founder and Chief Executive Officer of The True Athlete Project. Sam holds an MSc in Sport Policy, Management and International Development from the University of Edinburgh. His dissertation focused on the role of sport coaches as social change-makers. The research was based at The Crags Centre - an Edinburgh-based community sports centre that facilitates social impact through sport. Sam is also the head of mental wellbeing through sport at the centre. ​Sam is a certified mindfulness teacher and a USPTA professional tennis coach, with experience coaching all ages and standards - from total beginners to internationally-ranked juniors. A former tennis player, Parfitt won the 2006 London Youth Games and three British Tour doubles titles before moving to the United States in 2009 on a division one college tennis scholarship where he became a two-time All American Scholar Athlete. While Sam suffered with much ill health during his time in the States, Sam endeavoured to use his experiences in sport - both positive and negative - to help others. His academic work centered around sport and identity, and he became intimately involved in establishing projects which used sport as an agent for social change. He worked extensively within the context of sport for at-risk Hispanic youths and won multiple awards for his efforts, including the 2012 UTC and City of Chattanooga public service award and the Coleman Lew & Associates Leadership Award. After working within an NCAA Division I athletics department, he was appointed director of athletics at Saint Peter's School - an independent k through 5th school in Chattanooga, Tennessee. Here, he had the chance to create his own athletics program around a set of ideals that would help the children enjoy a positive start to their sporting careers. The program included a novel parkour program, sports poetry, mindfulness, and brought the school into the news for his inclusive and innovative approach to the holistic training of young athletes. During his time at St.Peter's School, Sam was also an NCAA Division I women's tennis coach, helping to take the Mocs to their best record for over twenty years. 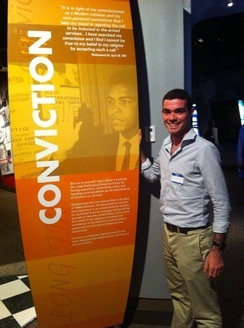 Sam has presented his work at the Muhammad Ali Center's Athletes and Social Change Forum, as well as to independent school educators, athletic directors and coaches. Sam has also spent time as the editorial advisor for The Diplomat magazine's sport and culture section and has worked in diverse settings such as the House of Lords and in national museums in the United Kingdom. Sam is most excited to see The True Athlete Project make a profound difference to the lives of athletes around the world, and to the culture of sport as a whole. Read: Sam Parfitt: "Chattanooga's Athletic Steve Jobs"
"At St. Peter's, he turns PE classes into a place where everyone is an athlete. He teaches kids about nutrition, positive imagery and gratitude. Athletics becomes less about battle-ball and more about soul-craft. "Performance and compassion, kindness, overall health and community spirit, all at once," Parfitt said. And he writes curriculum for coaches and schools, helping them do the same thing. He calls his work the True Athlete Project. He's turning athletes into true athletes."